I can recall that day I arrived in Nam as a green know it all rookie marine with an attitude. I was going to win the war by myself. What a dumb kid I must have been then. Only moments after arriving that day, reality set in and I learn quickly that I was in hell or some where close. 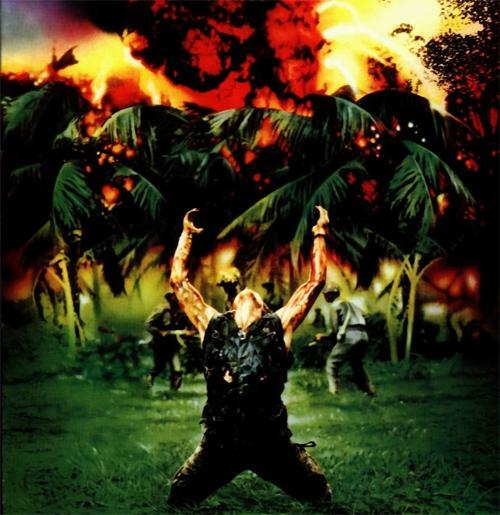 Last night I awoke to the sounds of thunder. I was recalling a small part of a day in Nam a long time ago. As if it was yesterday as I remember it was the height of the war. Let every nation know, whether, it wishes us well or ill, that we shall pay any price, bear any burden, meet any hardship, support any friend, oppose any foe, in order to assure the survival of liberty." -President John F. Kennedy, 1961 For those who fight for it, Freedom has a flavor the protected will never know. Those who have fought for freedom, and have lost it, know a sadness and sense a loss beyond bearing. Freedom rings loudest for those denied Freedom. 34th anniversary of the pullout was April 30th. The Vietnam War was the longest and most unpopular war in which Americans ever fought. And there is no reckoning the cost. The toll in suffering, sorrow, in rancorous national turmoil can never be tabulated. No one wants ever to see America so divided again. And for many of the more than two million American veterans of the war, the wounds of Vietnam will never heal. Their names are engraved on the black granite of the Vietnam Veterans Memorial in Washington, D.C. as well as on the hearts of those who love them. They are the 58,226 Americans who paid the supreme sacrifice in the service of their country in Southeast Asia. Zoom in and interactively explore the Vietnam Veterans Memorial Wall" to see the names of those who gave their lives in defense of the United States of America - We're Proud of You. 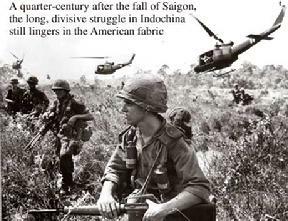 Nam was the longest military conflict in U.S. history. The hostilities in Vietnam, Laos, and Cambodia claimed the lives of more than 58,000 Americans. Another 304,000 were wounded. The Vietnam War was a military struggle fought in Vietnam from 1959 to 1975, involving the North Vietnamese and the National Liberation Front (NLF) in conflict with United States forces and the South Vietnamese army. From 1946 until 1954, the Vietnamese had struggled for their independence from France during the First Indochina War. At the end of this war, the country was temporarily divided into North and South Vietnam. North Vietnam came under the control of the Vietnamese Communists who had opposed France and who aimed for a unified Vietnam under Communist rule. The South was controlled by Vietnamese who had collaborated with the French. In 1965 the United States sent in troops to prevent the South Vietnamese government from collapsing. Ultimately, however, the United States failed to achieve its goal, and in 1975 Vietnam was reunified under Communist control; in 1976 it officially became the Socialist Republic of Vietnam. During the conflict, approximately 3 to 4 million Vietnamese on both sides were killed, in addition to another 1.5 to 2 million Lao and Cambodians who were drawn into the war. US troops during the war in Vietnam in 1966. Sunday is the 25th anniversary of the pullout. (AP file photo) The Vietnam War was the longest and most unpopular war in which Americans ever fought. And there is no reckoning the cost. The toll in suffering, sorrow, in rancorous national turmoil can never be tabulated. No one wants ever to see America so divided again. 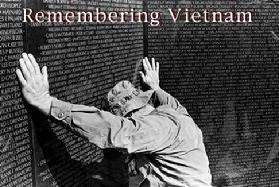 And for many of the more than two million American veterans of the war, the wounds of Vietnam will never heal. Fifty-eight thousand Americans lost their lives. The losses to the Vietnamese people were appalling. The financial cost to the United States comes to something over $150 billion dollars. Direct American involvement began in 1955 with the arrival of the first advisors. The first combat troops arrived in 1965 and we fought the war until the cease-fire of January 1973. To a whole new generation of young Americans today, it seems a story from the olden times. Thanks for stopping by click here for our Home page to this website or my page 1st Recon Bn. You can email me at floydruggles@1streconbn.com 24/7.